The Apprentice host was one of a large number of peers taking part in a massively oversubscribed debate called by the Hindu peer Lord Popat, entitled “Reassuring the Jewish community over the impact of antisemitism”. Speaker after speaker — primarily non-Jews — got to their feet to declare solidarity with the Jewish community and to pledge ongoing support in the fight against antisemitism. Lord Popat made it clear from the start that “the notion that [antisemitism] is solely a Jewish problem is as dangerous as it is wrong”, and quoted the famous aphorism by Pastor Niemoller about failing to speak up on behalf of those who are oppressed. But three other contributions electrified the House of Lords: those from former chief rabbi Lord Sacks, from the president of Ajex Lord Sterling, and from the Labour peer Lord Mendelsohn. Lord Sacks recalled the many years in which “hatred went unchecked, and no-one said stop”. He said he had not anticipated seeing the rise of such hatred again in his lifetime, and expressed gratitude to Lord Popat for initiating the debate. Lord Sterling dismissed claims that Jews would leave Britain. “We are British Jews, and we are not going anywhere”, he insisted. 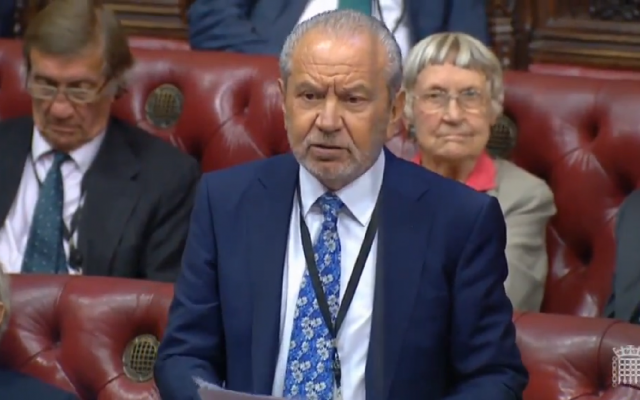 Lord Sugar, in trenchant remarks, said that the Labour leader had “allowed the issue to rumble on for months. What kind of leader is he not to take his party by the scruff of the neck and make them see sense and kill the matter off, once and for all?” He described far-left activists such as Peter Willsman as “a complete and utter clown”, and reiterated that in voting terms, Mr Corbyn “simply does not care” about the Jewish community. He urged his fellow peers “to use all efforts to ensure that Jeremy Corbyn does not become leader of this country”.